Created by Greg as a tribute to the 80th birthday of the Caped Crusader! 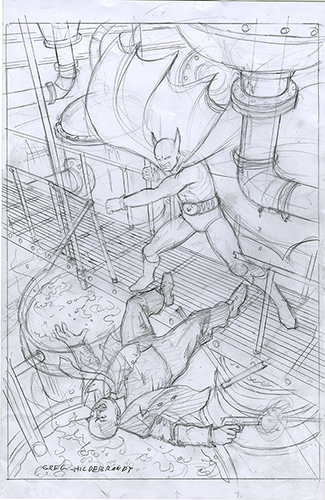 This is the preliminary drawing for a Black Board image depicts a reinterpretation of a fight scene from Detective Comics #27. It shows The Batman punching the two-bit thug Styker into a vat of acid! "It's a fitting end for his kind."